I'm Matt and despite the fact that I am a Newbie, this is not my first Ant. My First ant, Lightning Spark, was pretty exceptionally bad. However I made it 5 years ago and had limited funds and resources, so that is to be expected i guess. Now that I have more funds (my student loan) and resources, I thought I would make another ant. Some of the old bits such as the receiver and battery pack are still intact from Spark, however all the servos have gone so I thought I would replace them. I toyed with the idea of using Gearmotors but decided that essentially, I couldn't be bothered. Ive ordered a weapon servo, a Turnigy TG9E, and was just wondering if anyone else has used this for a weapon, and if its any good! Will post the Models once i've finished them. They have a shaft with a flat on to drive the potentiometer (position sensor). Cut this shaft short so that is doesnt move the pot and you are good to go. No need to solder and no mechanical stops to cut out. I would recommend the speed mod if you do use sg90's, otherwise they are a bit slow. To do this you bond the output gear to the one on the same shaft as it (using epoxy/araldite) and remove the top gear from the middle shaft. Cheers for the recommendation! I got a couple off those as well as some FS90Rs which are 360 servos. Going to decide which to use for this bot depending on reliability mainly as I don't really want to be replacing the servo every five minutes. Wheels is my next problem. Does anyone have any recommendations for wheels that would be suitable to use with a servo? I don't really want to spend too much on them but i would like some that are fairly decent, if at all possible. 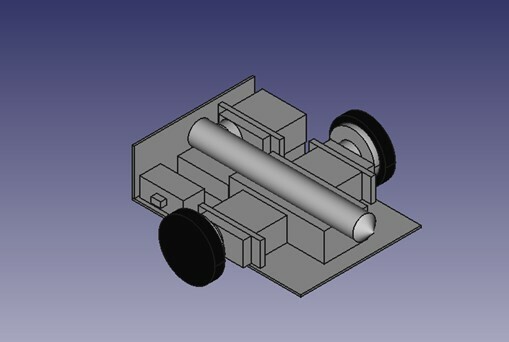 As I have never properly used CAD before, this took me quite a while and although it isn't very detailed, something i haven't quite figured out yet, this is roughly what the currently nameless ant will look like. I don't imagine this 'weapon' will do much, but at least it acts as a self righting mechanism. Now my exams are done for a bit, i'm probably going to start with the construction, though this could take a while. Hopefully to be ready for the next AWS! Due to Uni work, progress has been intermittent, but there's not much left to do to be ready for the next AWS. I have signed up for it on Antlog and was just wondering if I needed to do anything else before the event. I'm looking forward to it, and meeting all of you and testing how (badly) my ant will do against others! Also I was looking through the rules and i noticed that LiPo's need to be charged in a LiPo bag. but to the best of my knowledge, my battery is not a LiPo. Would it still need charging in a bag or am I ok to charge it without one? So long as your robots are signed up to the event in Antlog, that is it. You just need to arrive at the event. You do need to confirm the chemistry of your battery. If it isn't a LiPo then technically you wouldn't need a bag but I'd always err on the side of caution. One of my Ants uses a LiFe battery and I'd still put that in a charging bag. If the battery is a NiMh, I'd suspect you'd be OK without a bag though this is just my opinion. Well after a couple of weeks working on it on and off, I have finally finished my ant, Mildly Effective! It is very poorly built due to my lack of real tools and inability to cut in straight lines, but it holds together with a bit of help from some duct tape! The lifting arm has been giving me trouble as has a tendency to fall off but I think I have sorted it so hopefully it won't break mid fight. It is fairly slow due to me only being able to use servos but the lifting arm (when it works) is mildly effective so that's a nice plus. I'm looking forward to this weekend even if it inevitable does poorly in competition, it will be a good experience! Here it is in all its duct taped glory! I very much expect the arm will fall off but that shouldn't be too much of an issue! It's been a while but I have returned! AWS went about as badly as it could have done, thanks in part to my complete inability to attach my lifting arm which fell off in both battles, leaving me upside down with no way to right myself! So I decided to completely remake the chassis of Mildly Effective purely because I didn't really like the design of the old one and due to the fact that it was barely hold together, mostly by duck tape. Nothing has changed in terms of parts, it still has the same servos for drive/weapon but at least this time the arm is securely attached meaning hopefully it won't fall off again! Signed up for Botfest since it is relatively close to me and I need a bit more driving practice, but I'm very much looking forward too it, even if my robot isn't the most competitive.